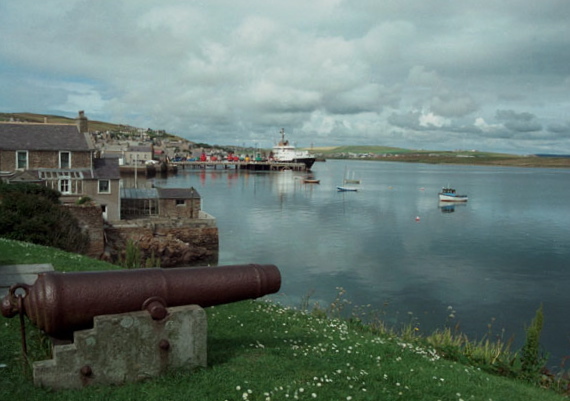 On a Monday morning in May last year, the Atlantic tide set a turbine in motion on the seabed off Orkney, and the energy captured was connected to the national grid. It was, said Jim Mather, Scotland’s Minister for Enterprise, Energy and Tourism, a “massive step forward”. The amount of electricity generated may have been tiny, but for marine engineers the significance was huge. Their industry had stopped paddling and started to swim. For small companies trying to get wave or tide devices off the drawing board and into the sea, many problems lie in wait. All turbines, whether they sit on the seabed or float, must withstand that once-in-a-century wave that could be a thousand times more powerful than the average. Conditions vary with the seasons and the seabed. A device that works in a fjord might not function in a firth. Rigorous, long-term testing is therefore vital. “There are parallels with wind,” says Alan Mortimer, head of renewables policy at Scottish Power. “Many different types of turbine were proposed in the early Eighties. They boiled down to a small number of successful concepts. The same needs to happen with marine devices, but the difference is that they need to be full- size just to be tested. That, however, is hard to find. The Wave and Tidal Energy Support Scheme (Wates), which put GBP13.5 million into promising technologies, is now closed. Last year the Scottish Government offered the 10m Saltire Prize for a commercially viable scheme, but the Institution of Mechanical Engineers (IMechE), in its recent report Marine Energy: More Than Just a Drop in the Ocean?, called on the Government to provide another 40m. Scotland has a quarter of Europe’s tidal resources and a tenth of its wave potential. Around 1,000 people work in Scottish marine energy, but that figure could billow. “You’re talking about an exercise that could transform the marine industry into something equivalent to oil and gas,” says Martin McAdam, whose company, Aquamarine Power, is growing fast. Among his rivals in Scotland are AWS Ocean Energy, based near Inverness, with Archimedes, a submerged wave machine; Hammerfest UK, which wants to develop three 60MW tidal sites and is working with Scottish Power; Pelamis Wave Power, who are based in Edinburgh; and Scotrenewables, based in Orkney, who are currently developing a floating tidal turbine. Politicians need to be educated about marine energy’s potential, says Banks. Indeed, IMechE has highlighted the need for sustained political leadership if what many see as the biggest problem – that of the grid – is to be solved. Why bring energy onshore if it can’t then reach homes? “Grids were built to connect large power stations to cities. Now you’re going to have electricity generated all over the countryside. It’s a huge challenge,” says McAdam. Such a system would help to overcome a frequent objection to renewables – their fickleness. If waves were strong in Scotland, Finland or France could benefit, and vice versa. Another challenge is the cost of installation. “At the moment we’re competing with oil and gas for boats,” says McAdam. “We need to move away from using heavy-lift, jack-up vessels.” The answer might be devices that can be floated into position and then weighted down. The race between suppliers is speeding up. Permission for a 4MW station at Siadar, off Lewis in the Western Isles, has just been granted to Wavegen, based in Inverness, and Npower Renewables. It could power about 1,500 homes, creating 70 jobs. Among the success stories are the three 140-metre, red tubes developed by Pelamis (named after a sea serpent) which already float off the northern Portuguese coast at Aguadoura. More Pelamis turbines are to be installed at EMEC, along with Aquamarine’s wave device Oyster. Oyster is basically a giant flap which feeds wave energy onshore to be converted to electricity. It has already been made, at a former oil and gas plant at Nigg, north of Inverness. A high- pressure pipeline was completed in December and a hydro-electric station will be installed this spring. In the summer, Oyster will finally be bolted to piles hammered into the seabed. Unlike wave energy, tidal power needs a channel between two land masses – and in the roaring Pentland Firth, between Caithness and Orkney, Scotland has what has been called “the Saudi Arabia of marine power”, Europe’s largest tidal resource. To exploit it, a GBP2 million contract to build Aquamarine’s tidal power device, Neptune, was awarded last month. It will be tested at EMEC. Elsewhere, SeaGen, an “underwater windmill” developed by a Bristol company, has just generated 1.2MW near the mouth of Strangford Lough, Northern Ireland. But the most controversial of Britain’s tidal energy schemes is, of course, in the Severn Estuary, where a barrage could provide around 5% of Britain’s energy. Environmentalists fear irreparable damage to marshes and mudflats, but the Government is known to prefer the barrage to other, smaller options. The decision it takes next year is sure to be eagerly watched in Scotland. Somewhat overshadowed by the Severn plan is Wave Hub, a project to build a wave-power station 10 miles off St Ives, on Cornwall’s north coast, using both Pelamis and a sea-bed device developed by ORECon of Plymouth. An application to create a safety area around it has just been submitted, part of the meticulous planning that precedes any marine trial. You only have to look at waves pounding a beach, inexorably wearing cliffs into rubble and pounding stones into sand, to appreciate the power of the ocean. As soaring oil prices and concern over climate change give added urgency to the search for new, renewable sources of energy, the sea is an obvious place to look. In theory the world’s electricity needs could be met with just a tiny fraction of the energy sloshing around in the oceans. Alas, harnessing it has proved to be unexpectedly difficult. In recent years wind farms have sprouted on plains and hilltops, and solar panels have been sprinkled across rooftops and deserts. But where the technology of wind and solar power is established and steadily improving, that of wave power is still in its infancy. 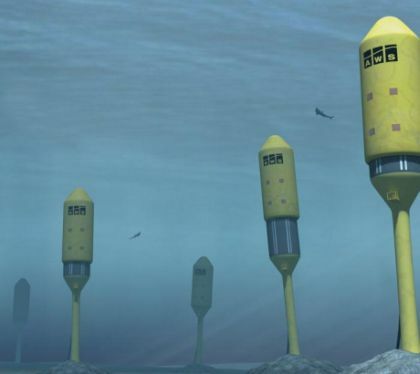 The world had to wait until October 2007 for the first commercial wave farm, consisting of three snakelike tubes undulating with the Atlantic swell off the coast of Portugal. In December Pacific Gas & Electric, an American utility, signed an agreement to buy electricity from a wave farm that is to be built off the coast of California and is due to open in 2012. Across the world many other wave-power schemes are on the drawing board. The story of wave power, however, has been one of trials and tests followed by disappointment and delays. Of the many devices developed to capture wave energy, none has ever been deployed on a large scale. Given wave power’s potential, why has it been so hard to get the technology to work—and may things now be about to change? The first patents for wave-power devices were issued in the 18th century. But nothing much happened until the mid-1970s, when the oil crisis inspired Stephen Salter, an engineer at the University of Edinburgh, in Scotland, to develop a wave generator known as Salter’s Duck. His design contained curved, floating canisters, each the size of a house, that would be strung together and then tethered to the ocean floor. As the canisters, known as Ducks, were tossed about by the waves, each one would rock back and forth. Hydraulics would convert the rocking motion to rotational motion, which would in turn drive a generator. A single Duck was calculated to be capable of generating 6 megawatts (MW) of electricity—enough to power around 4,000 homes. The plan was to install them in groups of several dozen. Salter’s Duck never took to the seas, but it sparked interest in the idea of wave power and eventually helped to inspire other designs. One example is the Pelamis device, designed by some of Dr Salter’s former students, who now work at Pelamis Wave Power, a firm based in Scotland. Three such devices, each capable of generating up to 750kW, have been deployed off the coast of Portugal, and dozens more are due to be installed by 2009. There are also plans for installations off Orkney in Scotland and Cornwall in England. As waves travel along the 140-metre length of the snakelike Pelamis, its hinged joints bend both up and down, and from side to side. This causes hydraulic rams at the joints to pump hydraulic fluid through turbines, turning generators to produce electricity. Pelamis generators present only a small cross-section to incoming waves, and absorb less and less energy as the waves get bigger. This might seem odd, but most of the time the devices will not be operating in stormy seas—and when a storm does occur, their survival is more important than their power output. The Aquabuoy, designed by Finavera Renewables of Vancouver, takes a different approach. (This is the device that Pacific Gas & Electric hopes to deploy off the California coast.) Each Aquabuoy is a tube, 25-metres long, that floats vertically in the water and is tethered to the sea floor. Its up-and-down bobbing motion is used to pressurise water stored in the tube below the surface. Once the pressure reaches a certain level, the water is released, spinning a turbine and generating electricity. The design is deliberately simple, with few moving parts. In theory, at least, there is very little to go wrong. But a prototype device failed last year when it sprang a leak and its bilge-pump malfunctioned, causing it to sink just as it was due to be collected at the end of a trial. Finavera has not released the results of the trial, which was intended to measure the Aquabuoy’s power output, among other things. The company has said, however, that Aquabuoy will be profitable only if each device can generate at least 250kW, and that it has yet to reach this threshold. Similar bobbing buoys are also being worked on by AWS Ocean Energy, based in Scotland, and Ocean Power Technologies, based in Pennington, New Jersey, among others. The AWS design is unusual because the buoys are entirely submerged; the Ocean Power device, called the PowerBuoy, is being tested off the coast of Spain by Iberdrola, a Spanish utility. 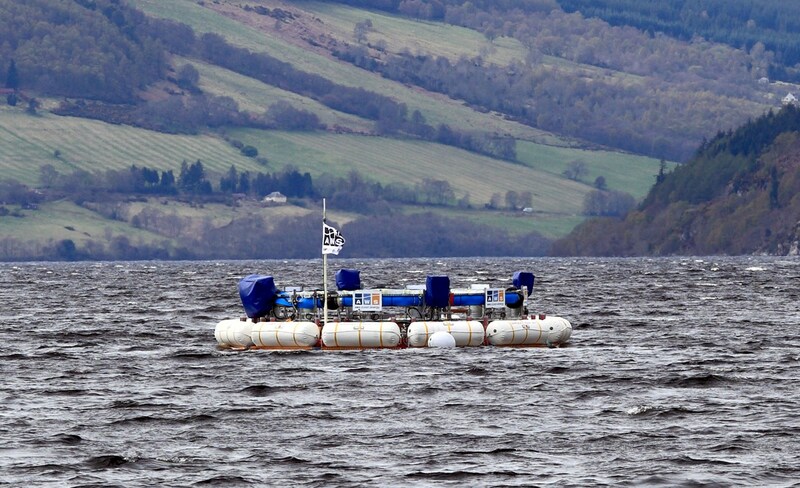 The Oyster, a wave-power device from Aquamarine Power, another Scottish firm, works in an entirely different way. It is an oscillating metal flap, 12 metres tall and 18 metres wide, installed close to shore. As the waves roll over it, the flap flexes backwards and forwards. This motion drives pistons that pump seawater at high pressure through a pipe to a hydroelectric generator. The generator is onshore, and can be connected to lots of Oyster devices, each of which is expected to generate up to 600kW. The idea is to make the parts that go in the sea simple and robust, and to keep the complicated and delicate bits out of the water. Testing of a prototype off the Orkney coast is due to start this summer. The logical conclusion of this is to put everything onshore—and that is the idea behind the Limpet. It is the work of Wavegen, a Scottish firm which is a subsidiary of Voith Siemens Hydro, a German hydropower firm. A prototype has been in action on the island of Islay, off the Scottish coast, since 2000. The Limpet is a chamber that sits on the shoreline. The bottom of the chamber is open to the sea, and on top is a turbine that always spins in the same direction, regardless of the direction of the airflow through it. As waves slam into the shore, water is pushed into the chamber and this in turn displaces the air, driving it through the turbine. As the water recedes, air is sucked back into the chamber, driving the same turbine again. The Limpet on Islay has three chambers which generate an average of 100kW between them, but larger devices could potentially generate three times this amount, according to Wavegen. Limpets may be built into harbour breakwaters in Scotland and Spain. Dozens of wave-energy technologies are being developed around the world: ideas, in other words, are not what has held the field back. So what has? Tom Thorpe of Oxford Oceanics, a consultancy, blames several overlapping causes. For a start, wave energy has lagged behind wind and solar, because the technology is much younger and still faces some big technical obstacles. “This is a completely new energy technology, whereas wind and photovoltaics have been around for a long time—so they have been developed, rather than invented,” says Mr Thorpe. The British government’s decision to shut its wave-energy research programme, which had been the world’s biggest during the 1970s, set the field back nearly two decades. Since Britain is particularly well placed to exploit wave energy (which is why so many wave-energy companies come from there), its decision not to pursue the technology affected wave-energy research everywhere, says Mr Thorpe. “If we couldn’t do it, who could?” he says. Another practical problem is the lack of infrastructure to connect wave-energy generators to the power grid. The cost of establishing this infrastructure makes small-scale wave-energy generation and testing unfeasible; but large-scale projects are hugely expensive. One way around this is to build a “Wave Hub”, like the one due to be installed off the coast of Cornwall in 2010 that will provide infrastructure to connect up wave-energy arrays for testing. But at last there are signs of change. Big utilities are taking the technology seriously, and are teaming up with wave-energy companies. Venture-capitalists are piling in too, as they look for new opportunities. Several wave-energy companies are thought to be planning stockmarket flotations in the coming months. Indeed, such is investors’ enthusiasm that Mr Thorpe worries that things might have gone too far. A big failure could tarnish the whole field, just as its prospects look more promising than ever. Wave power refers to the energy of ocean surface waves and the capture of that energy to do useful work – including electricity generation, desalination, and the pumping of water (into reservoirs). Wave power is a form of renewable energy. Though often co-mingled, wave power is distinct from the diurnal flux of tidal power and the steady gyre of ocean currents. Wave power generation is not a widely employed technology, and no commercial wave farm has yet been established (although development for the first commercial wind farm in the Orkneys are well under way). Below you will find a selection of technologies used to convert wave energy into electricity. Pelamis Wave Energy Converter: The Pelamis is a semi-submerged, articulated structure composed of cylindrical sections linked by hinged joints. The wave-induced motion of these joints is resisted by hydraulic rams, which pump high-pressure oil through hydraulic motors via smoothing accumulators. The hydraulic motors drive electrical generators to produce electricity. Power from all the joints is fed down a single umbilical cable to a junction on the sea bed. Several devices can be connected together and linked to shore through a single seabed cable. Finavera’s AquabuOY: The AquaBuOY is a floating buoy structure that converts the kinetic energy of the vertical motion of oncoming waves into clean electricity. It utilizes a cylindrical buoy as the displacer and the reactor is a large water mass enclosed by a long vertical tube underneath the buoy. Aegir Dynamo: The Aegir Dynamo™ functions in a unique fashion by generating electrical current from the motion of the prime mover in one phase via a direct mechanical conversion and the use of a bespoke buoyancy vessel. [YouTube=http://www.youtube.com/watch?v=r7-EPR8Ss6M”]Wave Dragon: Wave Dragon is a floating, slack-moored energy converter of the overtopping type that can be deployed in a single unit or in arrays of Wave Dragon units in groups resulting in a power plant with a capacity comparable to traditional fossil based power plants. [YouTube=http://www.youtube.com/watch?v=cGD20eObcF8″]OWC Pico Power Plant: Wave enters in the “hydro-pneumatic chamber” (resembling a cave with entry below the waterline). Up-and down- movement of water column inside chamber makes air flow to and from the atmosphere, driving an air turbine. The turbine is symmetric and is driven indifferently in which direction the air flows. AWS Wave Energy Converter: The AWS (Archimedes Wave Swing) wave energy converter is a cylinder shaped buoy, moored to the seabed. Passing waves move an air-filled upper casing against a lower fixed cylinder, with up and down movement converted into electricity. As a wave crest approaches, the water pressure on the top of the cylinder increases and the upper part or ‘floater’ compresses the gas within the cylinder to balance the pressures. The reverse happens as the wave trough passes and the cylinder expands. The relative movement between the floater and the lower part or silo is converted to electricity by means of a hydraulic system and motor-generator set. 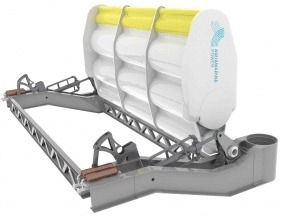 OpenHydro: The company’s vision is to deploy farms of open-centre tidal turbines under the world’s oceans – silently and invisibly generating electricity at no cost to the environment. OpenHydro’s technology enables the ocean’s immense energy to be harnessed for the benefit of all. The Open-Centre Turbine, with just one moving part and no seals, is a self-contained rotor with a solid state permanent magnet generator encapsulated within the outer rim, minimising maintenance requirements. SPERBOY: Developed and patented by Embley Energy, is a floating wave energy converter based on the ‘oscillating water column’ principle. Air displaced by the oscillating water column is passed through turbine-generators. Designed to be deployed in large arrays 8 to 12 miles off shore SPERBOYTM provides large-scale energy generation at a competitive cost.